Documentary photographer and film-maker Chris Leslie first visited war-torn Bosnia in 1996. He returned in late 2015 to see what had happened since. In this unique and honest portrait, Bosnians of all ages and affiliations reflect on 20 years of peace. The end of 2015 marks the 20th Anniversary of the Dayton Peace agreement that ended nearly four years of brutal war between Serbs, Croats and Bosniaks (Bosnian Muslims) including the longest siege in modern history. In April 1992, as Yugoslavia broke into independent nations, the city of Sarajevo fell under attack from Bosnian Serb military groups with the backing of the Serb-dominated Yugoslav army, who were against Bosnian independence. 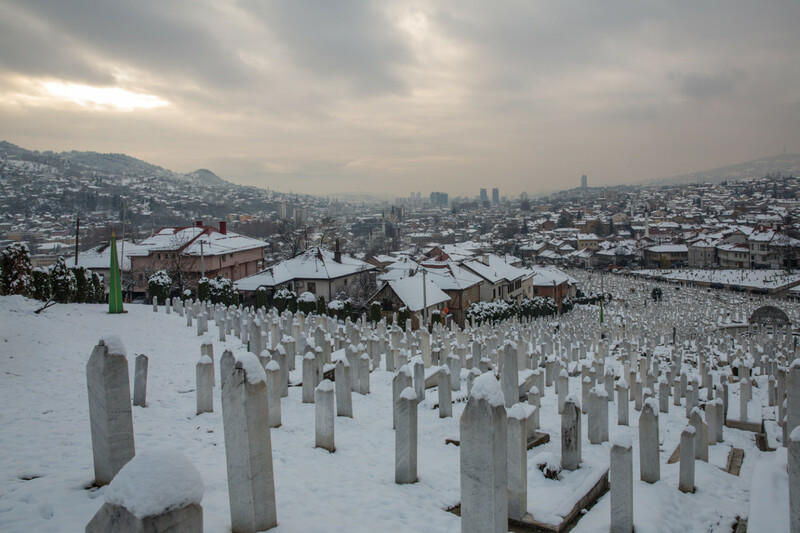 The Bosnian Serbs encircled the city and placed Sarajevo’s 500,000 citizens under siege. Sarajevans were bombarded by artillery and snipers shot residents as they walked in the streets. Beyond the capital the rest of Bosnia was ravaged. At least 100,000 people were killed, more than two million refugees fled the violence as villages and towns across the country were levelled and ethnically cleansed. In December 1995 the presidents of Serbia, Croatia and Bosnia were brought together to reach an agreement to end the war and effectively carve up the country. The US-brokered Dayton agreement created two highly autonomous entities inside Bosnia & Hercegovina (BiH): the Bosniak-Croat majority Federation and the Serb majority Republika Srpska. Internationally Dayton is viewed as a success story; Bosnia has been at peace for 20 years. But the agreement failed to bring Bosnians together into a single nation, nor did it bring economic prosperity. Frequently listed as one of the top city destinations for tourism and investment, Sarajevo puts on a brave, bold cosmopolitan face for the international community. Its process of rebuilding post-war has rebranded it with shopping malls, hotels and apartment blocks to make it look like any European city. But beneath the surface and beyond Sarajevo itself nationalism, political and economic corruption and mismanagement plague civic life. People from all sides struggle to make a basic living. Unemployment remains high at 44%, and many young people see no future in their state and want to leave the country. Since 1995 the world has also changed dramatically – post 9/11 brought with it wars in Iraq, Afghanistan. The early promise of the Arab Spring has brought its share of misery, terrorism and further wars of Western ‘intervention’. Bosnia has slipped off the Western radar losing it attention, funds and vital support. The post-Dayton political order is no longer enforced so that BiH is now expected to deliver stable democracy, economic prosperity and social justice without a supporting infrastructure. As a result, its efforts seems to have largely failed. In order to cling on to power certain politicians and their media allies promote increasingly nationalist agendas. The leader of the Bosnian Serb entity, Milorad Dodik has even publically argued for a referendum for independence from BiH. Talk of ‘conflict’ has returned to popular media. There is never a shortage of war stories in the newspapers, or footage of the conflict on television. A new generation, the so-called ‘War Babies’ born during or just after the conflict, have come of age. Now in their late teens and early 20s, the War Babies have no memory of the war. Separate education systems work to replicate the divisions. Each side enforces their own historical perspectives and political ideologies upon this generation. There seems almost no scope for integration. “Dayton is the past – and 20 years ago there was still a lot of hatred when it was signed. There is still some hatred today, but there is a new generation, and I believe in that new generation, I am part of it, and we all want to move on. Even some of those who fought in the war would agree – they are also tired of the corruption, nationalist rhetoric and media distortions. Yet so long as they create tensions and divisions, then their power, wealth and influence remain. Kemir a 20 year old Bosniak student from Sarajevo also added: “A lot of people in Bosnia are considering peace as something unusual and special , thus accepting every kind of injustice from the government. Bozo Jevric, 62, from Vares is a Bosnian Serb soldier who once fought against his Muslim neighbours on the frontline. Today he and his former enemies, with the assistance of an NGO, are working together to transform their remote mountain village into a small eco-tourist resort for hillwalkers and tourists. “The best thing about Dayton 20 years ago was that I could finally throw away my gun ” he told me. Twenty years on and memories are still raw, the pain still evident. That Bosnia has not descended back into war is something to celebrate; Sarajevans still rejoice in the simple fact that today they can walk down the streets of their city without fear of shells or snipers. If people like Bozo and his neighbours can be supported in their small enterprises, if young people like Mladena can see a future in her country (and not join the thousands leaving) then there is a chance. A chance that Dayton agreement has not been a complete failure and that there is real hope for a lasting and meaningful peace where Serb, Croat or Bosniak can live in one country, Bosnia, together. And to Peace Conflict Research Centre – http://p-crc.org who work with young people across the divide in Bosnia & Hercegovina.